This article is about the retired NFL safety for the Dallas Cowboys. For the cornerback and punt returner, see Cliff Harris (cornerback). Clifford Allen Harris (born November 12, 1948) is a former professional American football safety who played for the Dallas Cowboys of the National Football League (NFL) for ten seasons. He appeared in five Super Bowls and was selected to six consecutive Pro Bowls. Harris retired from football at 31 to focus on his work within the oil business. Born in Fayetteville, Arkansas, Harris started his football career as a backup quarterback at Hot Springs High School, until moving to Des Arc High School for his senior season, where he was the starter and led the Class A Eagles to an undefeated season (11–0). Harris was only offered a scholarship to Ouachita Baptist University (OBU) in Arkadelphia, after his father’s roommate at Ouachita convinced head coach Buddy Benson to do it. Harris' father, O.J “Buddy” Harris, also played football for OBU. In college, Cliff became an accomplished defensive back. He played all of the secondary positions and was a quality kick returner. He was named to two All-Arkansas Intercollegiate Conference (AIC) teams and was part of the 1966 AIC Football Championship team during his freshman season. Harris was part of the track and field team and graduated with a double major in math and physics. Harris has been inducted into numerous athletic halls of fame, including the Texas Sports Hall of Fame (2015), the Arkansas Sports Hall of Fame (1985), the NAIA Hall of Fame (1978) and the Ouachita Athletics Hall of Fame (2003). 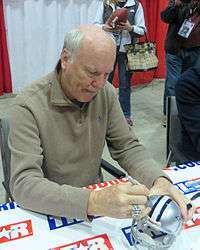 Harris signs autographs at a sports collectors show in Houston in January 2014. Harris was not chosen in the 1970 NFL draft, but the Cowboys invited him to training camp and he signed as a free agent. He beat out Cowboys third-round draft choice Charlie Waters (who did not crack the starting lineup until the retirement of Cornell Green following the 1974 season) for the starting free safety position his rookie year. 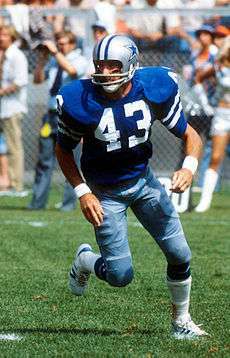 Military service caused him to miss the second half of the season, although he returned in time for the Cowboys' victory in Super Bowl VI over the Miami Dolphins and never relinquished the position after 1971. He eventually teamed up with Waters to form the top safety duo in the NFL in the 1970s. Harris made it a point to wear the pads of placekickers in order to keep his speed and quickness up. Harris was nicknamed "Captain Crash" by his teammates for his punishing hits and reckless pursuit of ball carriers and was also described as a "rolling ball of butcher knives" by hall of fame head coach George Allen. Pro Football Hall of Fame safety Larry Wilson said of Harris, "I feel Harris is the finest free safety in the business today. He changed the way the position is being played. You see other teams modeling their free safeties around the way Harris plays the pass, and striking fear in everyone on the field because he hits so hard.". The Cowboys' defense ranked in the top 10 every year with him in the lineup. Harris finished his ten NFL seasons with 29 interceptions, which he returned for 281 yards and one touchdown, and 16 fumble recoveries, which he returned for 91 yards. He also was used in special teams during the first half of his career, gaining 418 yards on punt returns and 1,622 yards returning kickoffs. 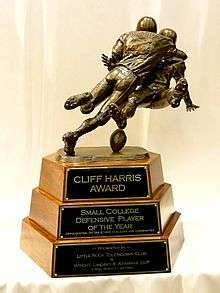 The Cliff Harris Award is presented to the top defensive player in the country representing Division II, III and NAIA colleges and universities. The Selection Committee includes Roger Staubach, Lee Roy Jordan, Walt Garrison, Gene Stallings, Jackie Smith, Drew Pearson, Rayfield Wright, Everson Walls, Charlie Waters, Bill Bates, Gil Brandt, Mel Renfro, Jim Hart and Cliff Harris. The inaugural winner of the Cliff Harris Award in 2013 was defensive back Pierre Desir from Lindenwood University in St. Charles, Missouri. Desir was featured in ESPN's Draft Academy and was selected in the fourth round by the Cleveland Browns. Receiving the 2014 award was Darius Allen, a senior defensive end from Colorado State University-Pueblo who helped the Thunderwolves to their first-ever NCAA Division II national championship. In 2014, OBU honored Harris by naming its new football stadium "Cliff Harris Stadium." The stadium, decked in the school's purple and gold colors, greets visitors approaching the OBU campus and includes more than 500 reserved and premium reserved seats as part of its total seating capacity. Ouachita football, whose mascot is the Tiger, has a rich tradition dating back to 1895 and competes in the Great American Conference in NCAA Division II. Harris is the author of Captain Crash and the Dallas Cowboys: From Sideline to Goal Line With Cliff Harris, first published in 2006 and re-released in September 2014. He and teammate Charlie Waters co-authored a book about their Cowboy memories called Tales From the Dallas Cowboys. Outside of football, he works in the energy business. 1 2 "Harris retires after 10 years". Bangor Daily News. Maine. Associated Press. March 27, 1980. p. 20. 1 2 "Cowboys' Harris calls it quits". The Hour. Norwalk, Connecticut. UPI. March 27, 1980. p. 33. 1 2 "Cliff Harris retires". Gadsden Times. Alabama. (AP photo). March 27, 1980. p. 15. ↑ Hansen, Greg (January 10, 1978). "Broncos ahead in diploma derby". St. Petersburg Independent. Florida. p. 1C. ↑ Loomis, Tom (January 10, 1979). "Cowboys' Harris, Waters keep on ruling the skies". Toledo Blade. Ohio. p. 28. ↑ Anderson, Dave (January 16, 1979). "Two safeties are contrasts for Cowboys". The Dispatch. Lexington, North Carolina. New York Times news service. p. 8. ↑ "Pro Football Hall of Fame thumbnails". Spokesman-Review. Spokane, Washington. Associated Press. January 31, 2004. p. C7.